Thank you very much to the NHM Secret Reviewer who put this post together! Last month, my son made an amazing toad in the hole. He’s two years old. 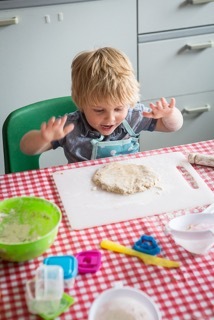 Before I sign him up for Masterchef, I should probably give some appreciation to the brilliant ladies at Tot Cross Buns. 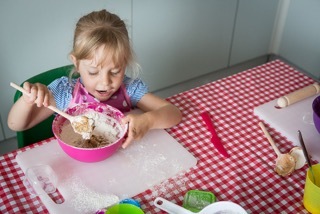 Tot Cross Buns is a cookery course for children aged 2 to 5 years old, with occasional Saturday cookery classes that also welcome school age children. 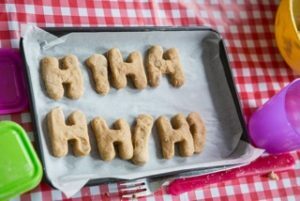 Their website says ‘The aim of Tot Cross Buns is to introduce children to food through taste, smell and touch all in a fun and relaxed environment. They’ll be cooking healthy recipes (some treats too! 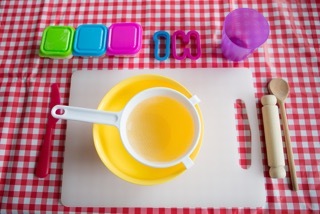 ), which have all been tried and tested, and will involve the children every step of the way – and there will be no washing up to worry about!’ The classes also include a food related activity carried out whilst the food is cooking. 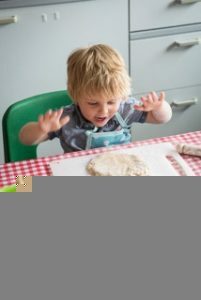 The classes are located at various sites in North Hampshire, close to Basingstoke, with times, locations and prices available on their website Tot Cross Buns. The business is the brainchild of local mum Allison and the classes are run by Allison and another local lady, Kerry, who runs the classes we’ve been attending. First off I should admit, I’m a little bit in love with Tot Cross Buns. I went for a taster session last month and we have been back every week since. I’d never heard of the idea of cooking classes for toddlers before and had only seen places offering biscuit decorating etc. Here, not only do recipes include Toad in the Hole, pasta, rosemary biscuits etc, they concentrate on being healthy, with the very occasional cheeky spoily week. They teach about the foods they are using, where they come from, and tend to carry this into the week’s activities. Kerry, as I’m sure Allison does too, takes the time to point out each ingredient and encourages the children to find the right ones and do as much as possible themselves. She goes around and helps where needed with support and a little one-to-one. She encourages involvement, asks lots of questions, and doesn’t miss a trick either; she will hone in on the quiet ones to make sure they feel involved (that includes my little one, and I still can’t believe he now shouts out answers to the group questions). 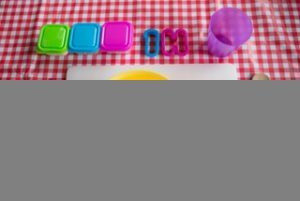 She also encourages independence, getting the children to carry their trays up on their own, put the dirty bits in the washing up box, and collect their baking one at a time, with a round of applause at the end. 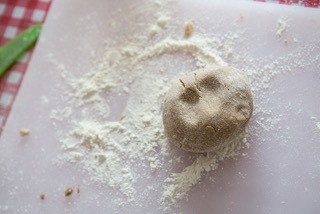 The activities themselves are well thought out and relevant to what is being cooked. From colouring, to tasting, to washing up, to planting herbs. Always different and always grabs the children’s attention whilst being educational. All this, plus you come away with great baking too! They also recently won the Muddy Stiletto Award for best children’s business in Hampshire 2017. Congratulations! Well deserved.